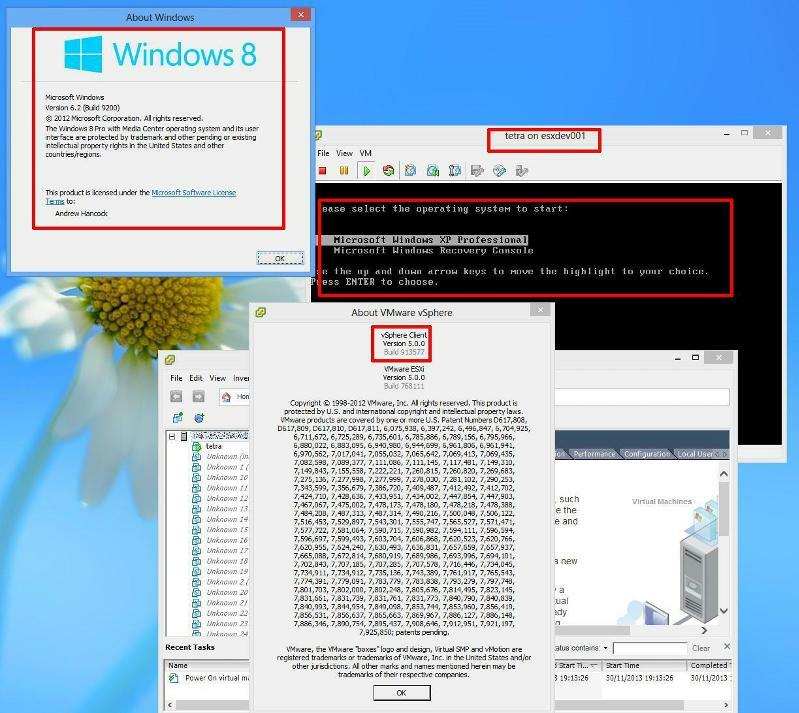 Getting following message at the time of connecting VMware ESXi 5.0 server through VMware vSphere Client 5.5 installed on Windows 8 workstation. "The required client support files need to be retrieved from the server "vsphereclient.vmware.com" and installed. Click Run the installer or Save the installer." I have saved the installer "VMware-viclient-all-5.0.0-455964-5.0.exe" and tried to run it, but it is not running because of incompatibility with Windows 8 Operating System. Please let me know how do I connect to ESXi 5.0 server via vSphere Client 5.5 installed on Windows 8 workstation. Go to properties and select compatibly, then select XP Service pack 3, and install. After that connect to the server, it should work. Please try the suggestion made by "Santasi24" in the post above. You will be able to perform all the tasks that you can via vSphere Client. If you have a need to use VMware vSphere Client 5.5, it's recommended now, that you switch and start using the VMware vSphere Web Client, because you cannot access all the features of vSphere 5.x, from the vSphere Client. None of the solutions helped me. I am trying to build a new setup and initially there will be no vCenter server. 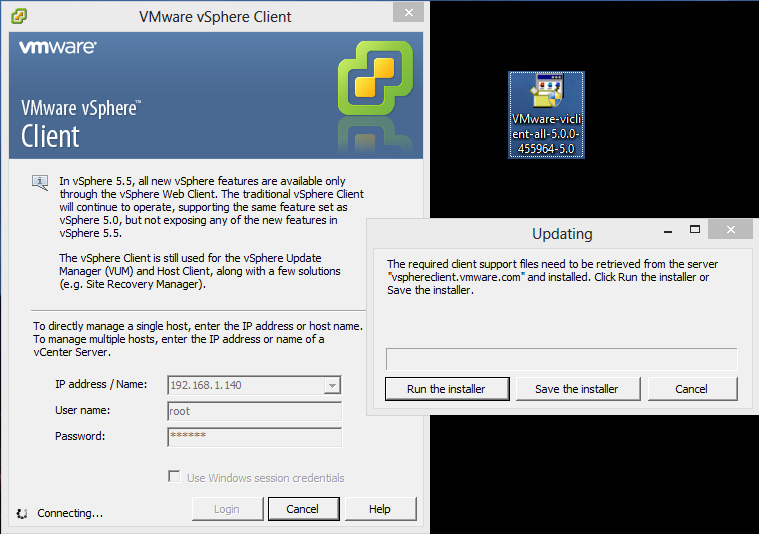 I can understand the drawback of not having vCenter server, but my simple question is that why not I am able to connect to the ESXi 5.0 server with vSphere Client "VMware-viclient-all-5.5.0-1281650" installed on Windows 8.0? Can you please confirm me whether vSphere Client 5.5 is compatible with ESXi 5.0 or not? Will it only work with ESXi 5.5? ESXi 5.5 client is used to connect to 5.5 when connecting to ESXi 5.0 it downloads and installs ESXi 5.0 client because it needs those DLLd from that client. Thanks for the update. That means it is not possible to connect to ESXi 5.0 through vSphere 5.5 installed on Windows 8. Am I right? what version of ESXi do you have? I have "VMware ESXi 5.0.0 (VMKernel Release Build 469512)". I've just had to get to the office this evening, so I'm going into one of our Labs to check this for you. okay, I'm testing against 5.0.0 Patch 7 which is Build 768111, you have 5.0.0 Build GA.
For yourt information, when you click the vSphere Client *.EXE Icon, this is a Launcher file, which detects "which" client it needs to load to connect to the correct version of ESXi. So if you have installed ESXi 5.5 Client, and try to connect to ESXi 3.5, 4.0, 4.1, 5.0 or 5.1, it will request and download a specific client which needs to be installed to connect to that server version. If you only have ESXi 5.0 in your organisation, the simplest way, is just to install the 5.0 client. BUT there have been installation issues with the 5.0 client and Windows 8.0, because Windows 8.0 was released after ESXi 5.0 was released! I have installed 5.0 client by changing the Compatibility Mode to "Windows 7" and it installed smoothly on Windows 8. I also able to connect to the ESXi server. The only problem is that when I am trying to install a Guest VM, the Console is showing the following message and nothing is happening. "The VMRC console has disconnected....attempting to reconnect" (please see the attached screenshot). 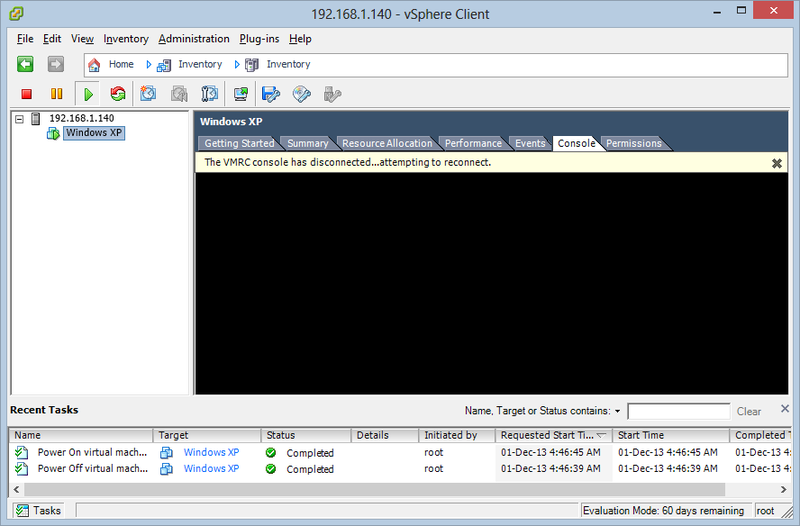 I have also tested with client VMware-viclient-all-5.1.0-1235233, but facing same issue just like 5.5 client. Okay, so you have successfully installed the client, by changing compatibility mode. 5.1 and 5.5 clients will not help your issues, they are NOT used when connecting to 5.0. Changing to compatibility mode, "is a hack" really, to get it installed. Complains, it's not compatible with Windows 8.0, only Windows XP SP2. If you try to force and installation, by changing compatibility mode, Console operations will not function. 1. Installs correctly, no need for changing compatibility level. 2. Does not give any error at installation. 1. I would recommend you uninstall the existing client, remove all VMware folders. Here's a screenshot of the VMware vSphere 5.0 Client Build 913577 on Windows 8.0, with Desktop Background showing, and version of Windows, with a Console. Superb!!!! The explanation is awesome. Thanks a lot for the right solution. VMware-viclient-all-5.0.0-913577.exe is working fine on Windows 8. I am able to work on ESXi 5.0 console as well. Thanks for your comments, it's always best to do it properly, rather than " hack job " solution! Glad you are up and working correctly!